A short biography of Spanish anarchist doctor and Civil War fighter Pedro Vallina Martinez, who resided in several countries during his life. 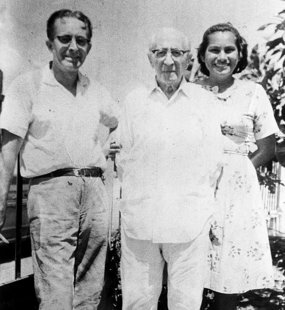 Pedro Vallina Martinez was born at Guadalcanal near Seville on 29 June 1879. He studied for his baccalaureate in Seville, and then moved to Cadiz where he became a convinced anarchist militant, thanks to the writings of the outstanding anarchist Fermin Salvochea. Vallina later got to know Salvochea in Madrid , where he was studying for medicine, and became his friend. He also associated with other libertarians and Republicans like Nicolas Estevanez, Soledad Gustavo, Urales, Corominas and Barriobero as well as the MPs Pi y Margall and Castelar, who later used their influence to keep him out of prison. He became a member of the Federacion de Trabajadores de la Region Espanola (FRTE - founded in 1881 and forerunner of the large anarchist union the CNT). He was condemned to 8 years hard labour for anarchist propaganda and fled to France in 1904. In Paris he made the acquaintance of Louise Michel, Elisee Reclus, Jean Grave, Sebastien Faure, Charles Malato, Armand Robin, James Guillaume and Francisco Ferrer. He continued with his anarchist activities. In 1905 he was implicated with Malato, Caussanel and an English anarchist Harvey in an attempt on the life of Alfonso XIII, the Spanish king. They came to trial in November 1905, but the case collapsed due to lack of evidence. He was expelled from France by the police in 1906. Vallina moved to London to continue his medical studies. Here he came in contact with Rudolf Rocker, Errico Malatesta and Tarrida del Marmol, and all those German, Russian, Polish, Italian, Spanish and Jewish anarchists who had fled repression. He was active in the protests in London against the repression in Spain. He organised various neo-Malthusian conferences on birth control in London. He took part in the international Antimilitarist Congress in Amsterdam in 1907. He took advantage of the 1914 amnesty to return to Spain. He continued anarchist activity in Seville, despite continued banishments, arrests and imprisonment. He ran a clinic there and started a campaign to found an anti-TB sanatorium He published the magazine Paginas Libres. He visited the most impoverished villages of Extramadura in the course of his forced exiles, and provided medical assistance to the poor as well as spreading anarchist ideas in these remote areas. He was finally expelled to Tangiers, and then Casablanca. In 1923-24 he was living in hiding in Lisbon, the base for his organising activities across the border. Discovered by the police he had to flee once more to France with his family. In 1931 he was again imprisoned for taking part in an uprising in Almaden, where he was practicing as a doctor. He organised militia groups against the military uprising of 1936 which kick-started the Spanish Civil War, especially in the areas where he had practiced. At the head of 500 Almaden miners on the 19 July, he took part in the taking of Santa Eufemia. He was head of health services in Madrid and then in charge of the hospital of the Del rosal Column at Canete. He was on the Albacete front until March 1938, and then was in Barcelona where he was in charge of the Bonanova hospital. He organised the evacuation of the Massanet hospital with the Francoist victory. Crossing the French border, he was interned in Perpignan. He managed to get on a boat to Mexico. In 1943 he moved to Oaxaca and set up the Consultorio Medico Quirurgico Ricardo Flores Magon (a surgical dispensary named after the famed Mexican anarchist) in Loma Bonita where he looked after the local Indians for the last 30 years of his life. The death of his compañera Josefina had a deleterious effect on his health. He died in Veracruz on 16 February 1970. He wrote a biography of his friend Salvochea and well as Mis Memorias (1968) an account of his life and L’espagne Inquisitorial (co-written with Arnold Roller aka Siegfried Nacht).